BTS video shoot, Photographer: Camilla Akrans, courtesy of Vogue Italy, shot and edited by Videoplugger. 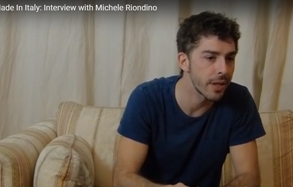 Cinema Made In Italy: Interview with Italian actor Michele Riondino, the actor from Wondrous Boccaccio (Maraviglioso Boccaccio) and the series Young Montalbano. Creativity and passion. We love being part of the action. Would you like to produce a video for your online campaign or to promote your brand? At Videoplugger, we provide specialised production and post production services. We offer full service behind the scenes fashion video and backstage HD video coverage of fashion shoots, photo shoots, film shoots and events in and around the UK, or worldwide on request. We are familiar working with clients such as Vogue and Marie Claire and our film crews are specialised in filming from a backstage perspective in a non-intrusive way that respects the work of the models and photographers. Whether in Europe, stateside or beyond, we can organise film crews and customised solutions for all your production needs. Our goal is always the same – to create a stress-free and productive environment for our clients. Our team has worked with prestigious clients such as Vogue Italy and Marie Claire Italy – and our experience shows. Whether you need a fashion video, backstage film or behind the scenes at a photoshoot, we are experienced at filming from a backstage perspective in a non-intrusive way that respects the work of the talent and photographer. Do you need event coverage and video production services? With a combination of artistic flair, technical expertise and attention to detail, Videoplugger can bring your vision to life. Videoplugger offers customised solutions for all your event coverage headaches. We can organise everything, from providing the crew on location, to producing tailor made footage such as vox pops, interviews, backstage and red carpet footage. You simply provide us with the brief and the talent and we’ll capture fresh, innovate and eye-catching footage. If you have any questions or would like to discuss your event or camera crew needs in more detail, please do not hesitate to get in touch with us!